Since starting Supergolden Bakes I have been a little spoiled for choice when it comes to reviewing food related products and services. 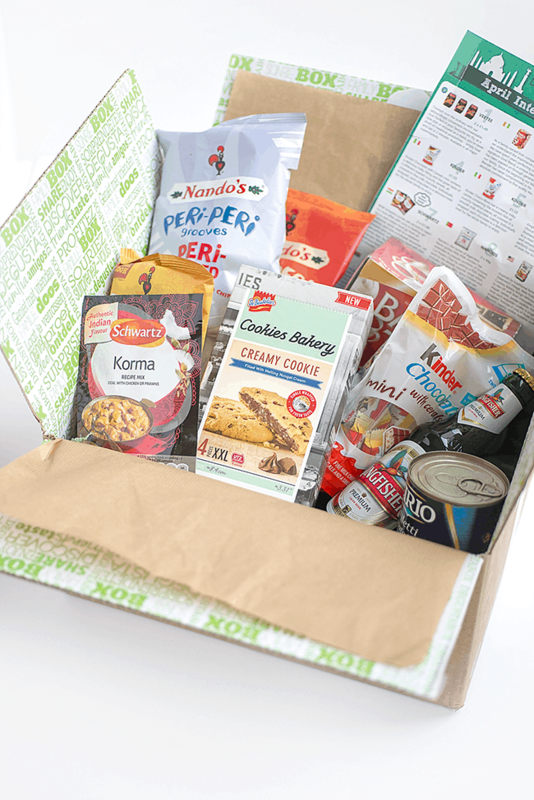 A couple of weeks ago, Degustabox got in touch asking me to review their April food box. I must admit that up until that email I had not heard of them, but a surprise box full of foodie delights sounded too good to pass up. The April food box had an ‘international’ theme and included products from Italy, Germany, Ireland, Portugal, South Africa, India and USA. Receiving and opening the box was exciting as I had no idea what to expect. Once I opened the box I was both delighted… and quite underwhelmed. I guess that is the inherent risk with any subscription service that offers surprise items – you are bound to like some more than others. • Cirio tomato fillets and tomato concentrate. Although I am not a stranger to Cirio brand I had not tried either of these products before and I absolutely loved them both. They worked great in my vegan aubergine meatball recipe and I will definitely be buying them again. • Barry’s Tea Teabags. I consider myself a tea snob but these teabags (an institution in Ireland) won my seal of approval. • Kinder chocolate with cereals and Choco-bons – my kids loved these and the fact that they are all individually sealed makes them perfect for taking along on outings. Perfect for bribing, I mean treating, the kids on a long Ikea trip. I may have eaten a few myself! • Kingfisher beer* – my husband was very happy with this item! It would have been more interesting to discover a lesser known brand though. • Debeukelaer Creamy Cookies. The package made these look like melt-in-the-mouth chocolate-filled homemade cookies. In reality they were quite dry and needed a cup of Barry’s Tea to help them go down. • Nandos peri-peri chicken crisps in three flavours – peri-salted, spicy chicken and sizzling hot. I cannot resist crisps but was not sold on the flavours. • Wonjo hibiscus drink*. This had an odd flavour – ‘definitely tastes like cola gone flat’ suggested my friend. Quite refreshing but I would much rather drink a cup of hibiscus tea. • Veetee microwaveable rice – peri peri and spicy Mexican style. Although convenient, I was not a fan of these flavours – though I regularly use their plain Basmati and wholegrain rice.• Energy drinks – there were three included in the box (Scheckters Organic Energy Drink and two IdrinQ energy drinks) which is three too many for me. • Schwartz authentic indian flavourings – korma and balti. I am a fan of Schwartz spices but prefer not to use pre-made mixes. * There were two different boxes available this month – alcoholic & non-alcoholic. I was sent both the Kingfisher beer from the alcoholic box and the Wonjo hibiscus drink from the non-alcoholic box. Although the value of the items included in the box definitely exceeds the cost of the subscription (£12.99 a month inclusive of £3 delivery) I was not overwhelmed with the selection in the April box. I think Degustabox would be a big hit with students or people in a shared accommodation as everyone is bound to find something they enjoy and the anticipation of receiving a monthly surprise package just adds to the fun. Disclaimer: I received a box from Degustabox for review purposes. All opinions are my own. Interesting ! This is a great idea. I'd been interested to try those cookies – won't bother now! I've never really been sold on the idea of food packages like this by post. You're right about a lot of the products being run of the mill and I hate packet mixes too, the only exception is when I feel particularly lazy and I make an Old El Paso Fajita dinner. I'd certainly never make a curry and use a packet mix over blending your own spices. I feel like a total snob now, my Mum cooks with microwaved and frozen rice and I ate it so much throughout my childhood that I can't bear the stuff. I had heard of Degustabox, but from seeing this, they're really not for me – I don't drink energy drinks either.